New Hampshire is the sort of US state that can't fail to astound you with its sheer rugged beauty. Its lakes, forests, verdant valleys and mountains make up a natural landscape that continues to attract outdoor types, as well as those with a more artistic bent. The American poet Robert Frost wrote many of his most famous works under the influence of New Hampshire farm life. 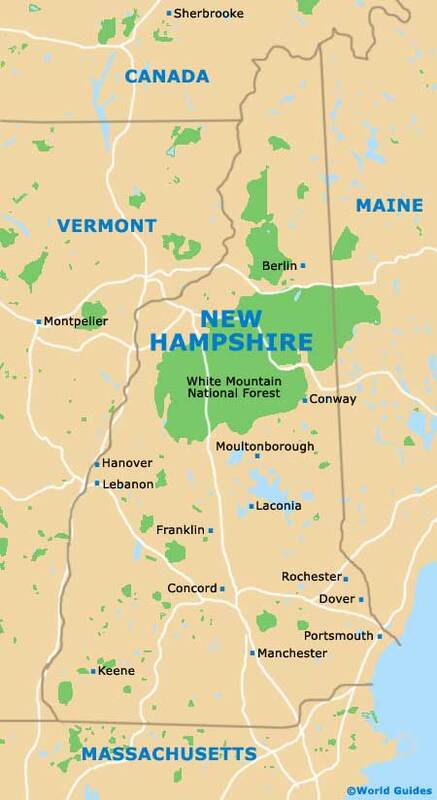 Located on the east coast of the USA and within the New England region, New Hampshire has become an all-round tourist destination. It has some of the biggest ski mountains for miles around and is now an extremely popular haunt for winter sports enthusiasts. In the fall, people come to see and photograph the color-changing foliage, while in the summer, holidaymakers occupy New Hampshire's many lakeside or seaside cottages. Visitors frequently hike the Appalachian Trail or drive to the top of Mount Washington to admire the views. As a former English colony, there is also plenty of heritage to explore in New Hampshire. The state's official motto is simply the phrase 'Live Free or Die'. Adopted in 1945, it says a great deal about the sense of independence fostered by New Hampshire folk. The phrase originates from a speech made by a famous soldier and local hero of the American War of Independence, General John Stark. The New Hampshire Motor Speedway is home to the oldest motorcycle race in North America, the Loudon Classic. The circuit in Loudon is known among the motor racing fraternity as 'The Magic Mile'.